Search engine traffic for architecture has been falling year over year since the invention of the search engine. At the same time, social media interest in Architecture and Design has increased exponentially on the most popular social media platforms. Every architecture firm’s marketing strategy is (or should be) adjusting to ensure we are reaching our audience where they are the most active. Facebook has spent a decade collecting information on the interests, psychology and behaviours of most Australians. This data can help us to better understand who is out there visiting our websites, liking our photos, and googling us. All good stuff for crafting the right message, and thinking about the demographics you should be targeting to promote your projects. In this article, we’re looking at data from 2.5m-3m monthly active Facebook users who are interested in architecture, which is roughly 15% of the entire Facebook population. 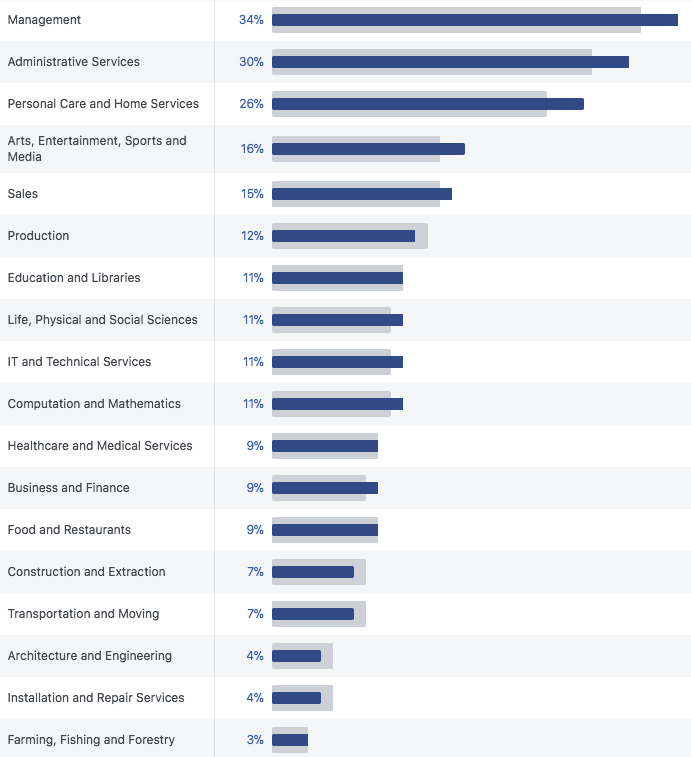 Two-thirds of Architecture’s audience are women, while women make up about half of Facebook users. In the graph above, we can see that people aged 25–34 are our largest audience on Facebook. 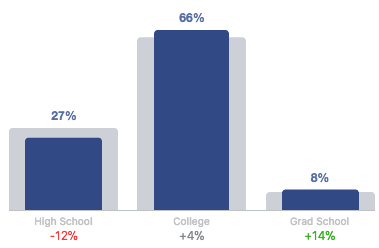 They are also over-represented, making up a higher percentage of our fans than their portion of total Facebook users. 18–24, 55–64 and 65+ groups all make up a smaller portion of our audience than they do of the overall Facebook population, implying that they are less interested in architecture-related content, relatively speaking. 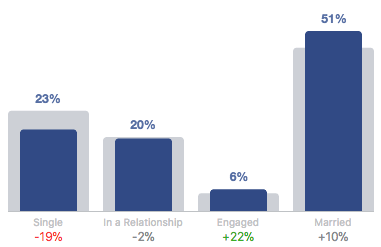 Self reported relationship data from Facebook suggests that the majority of architecture fans are either married or engaged (57% of our audience). While only 5% of Facebook users are engaged, they are 6% of our audience — suggesting that people are 22% more likely to be interested in architecture during their engagement. On the other hand, single people are 19% less likely to be interested in architecture. 74% of architecture’s fans have reached university level education, roughly in line with the overall Facebook population. A person who hasn’t been to university is 12% less likely to be interested in architecture. The three most common job titles for architecture fans are Management (34%), Administrative Services (30%) and Personal Care and Home Services (26%). The table below shows the most popular categories of interests that our audience have in common. 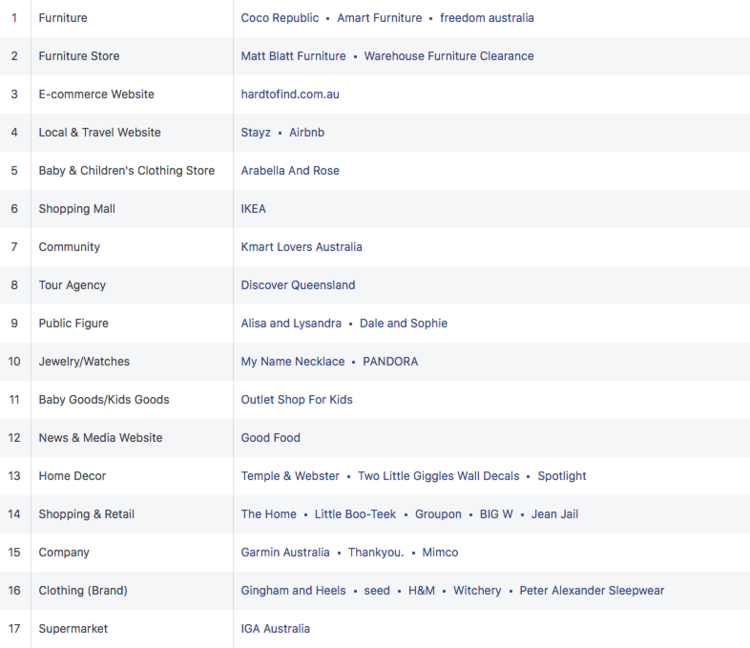 It’s noteworthy that furniture brands and furniture stores are at the top of the list. For each category, you can see the pages that our audience are most interested in. 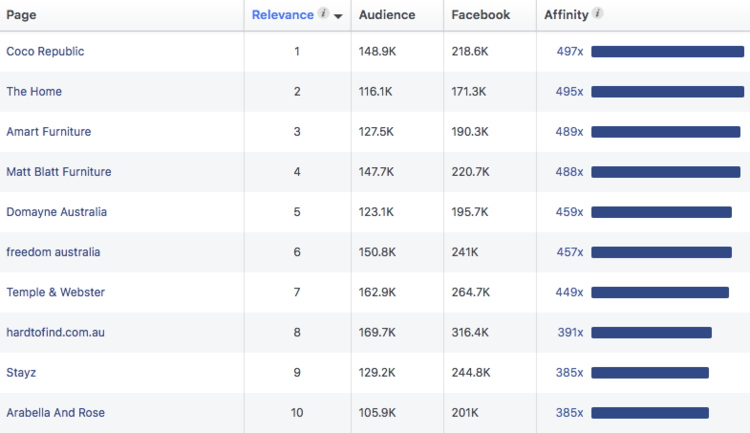 These are the Facebook pages that are most relevant to the architecture audience. The Affinity metric is how many times more likely it is that our audience likes one of these pages than the typical Facebook user. Again, we can see a strong furniture and homewares trend. 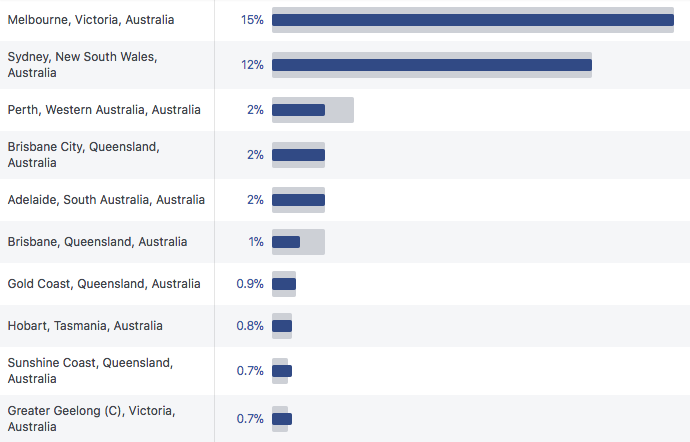 Melbourne and Sydney make up 27% of the Australian architecture audience, in equal proportion to their share of the overall Facebook population. The architecture audience is very active on Facebook, commenting, liking, and sharing at a much higher rate than the typical Facebook user. Additionally, they click significantly more ads in a typical month than the average user (100% more ad clicks), and most importantly, are clicking ads more often than they are liking posts. 96% of architecture fans are using Mobile phones as their primary way to access Facebook’s news feed. 50% of the users occasionally use desktop. Who is the average online architecture fan? She is a 25–34 year old woman, married, did an undergraduate degree and works in a management role. She lives in Melbourne, likes shopping for furniture and homewares online. She likes 39 posts per month, comments 25 times and clicks 41 ads each month. She accesses Facebook through her iPhone and never (or very rarely) logs into social media through a desktop computer or laptop.